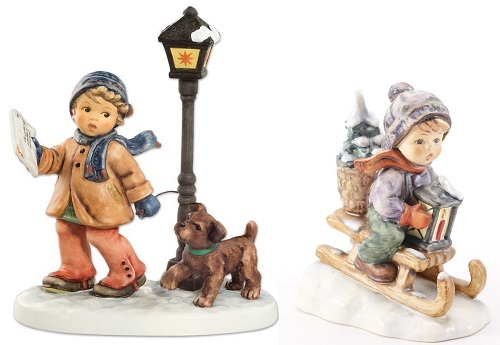 Most people are familiar with Hummel’s range of collectible figurines, plates and plaques. 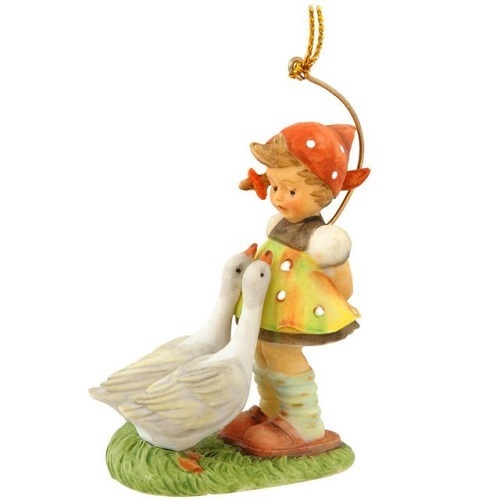 But did you know that Hummel also has a range of decorative collectibles as well? Christmas is a prime example of this, as Hummel has its own unique products that have been made specifically for decorating the household at this time of year. To help give you some ideas for decorating your Christmas Tree this year. 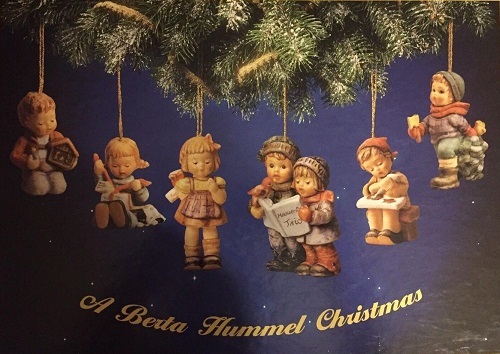 This article, will be covering some of the different types of Hummel Ornaments and Figurines that can be used to help spread the Christmas cheer. 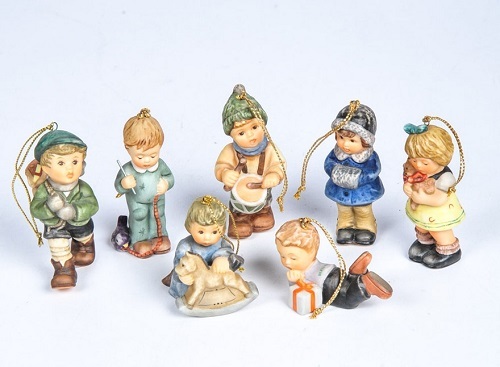 These miniaturized figurines are made to hang off of tree branches, hooks and corners. They still use the same adorable art style as their larger cousins. Some models are only available as Christmas ornaments, while others are miniaturized versions of the collectible figurines. Ornamental Hummel Figurines are made small to keep them as light as possible. If features on the full sized figurines could easily break away when they are reduced in size. They may strengthen the design by moving the parts closer together or by filling in any gaps. An example of this would be with the Goose Girl Hum Num 47#. They changed the base into a grassy texture so that they could more easily build up the base around the geese, offering them a better perch in which to anchor. If you have a collection of Hummel Figurines. It’s worth seeing if there are any Christmas Ornament versions of your favorite pieces, and to decorate your tree with these ornaments. 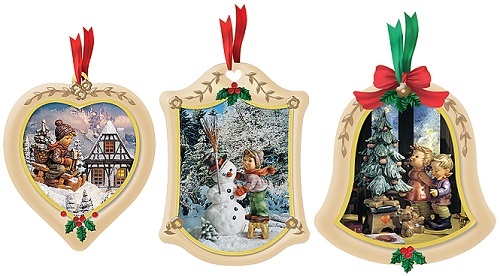 By displaying your favorite Hummels on your tree, it can allow others to share in the pride and joy that you feel when you are looking at your collection. 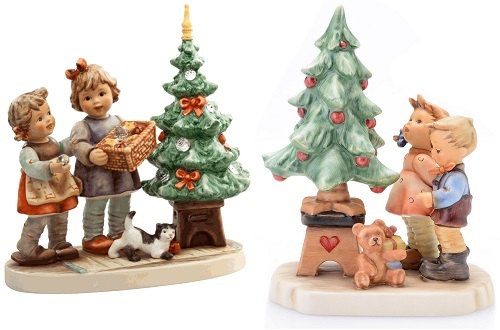 Even if you don’t have your own Hummel Figurine collection, these cute little ornaments can liven up any tree. They convey the same joy, wonder, innocence, and mischief as their larger counter parts, and their youthful visage and bright colors can draw the eye in a way that normal Christmas Ornaments can’t. 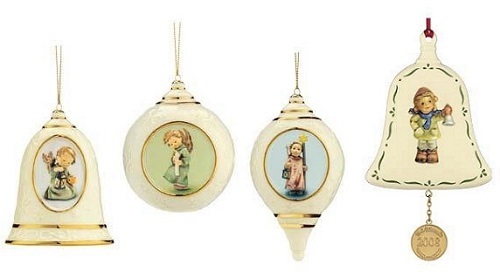 Glass Hummel Christmas Balls can add that little bit of artistic flare to any Christmas tree. Their simple yet elegant shape, breaks up the harsh lines of the Christmas tree. While many standard Christmas balls use solid colors and thick lines and patterns to draw the eye. 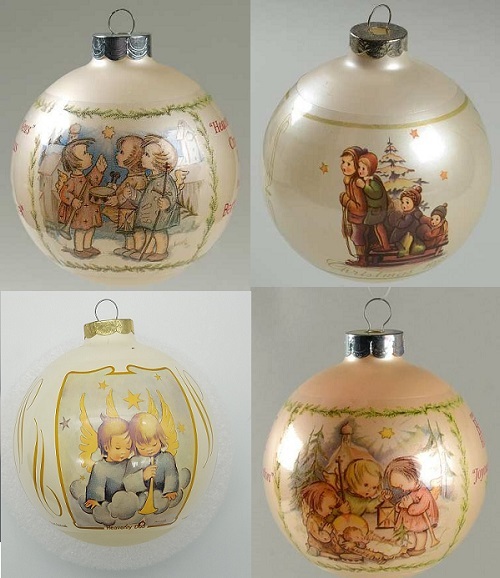 Hummel Christmas balls have images depicting Hummels or even the original art work by Sister Maria Innocentia Hummel. 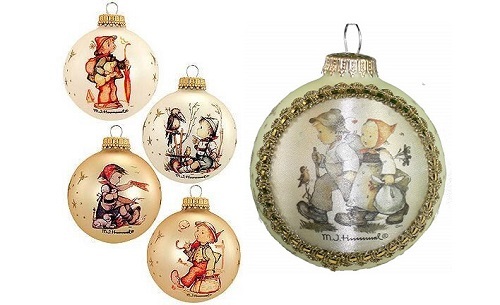 Fans of the original Hummel art work and art style, are able to collect plaque like Christmas ornaments that contain images and pictures for various Hummel designs. 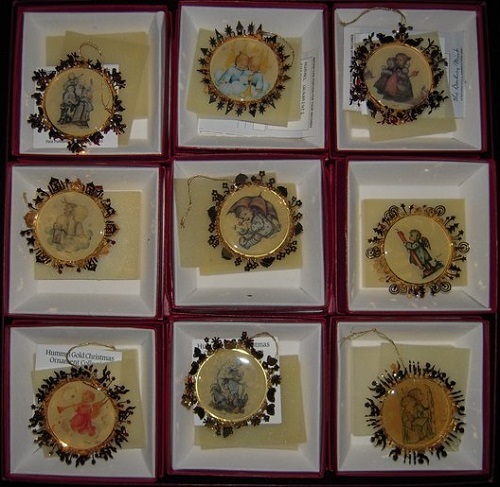 These ornaments either depict the original art work from Sister Maria Innocentia Hummel, or more modern renditions that feature Hummel figurines. Each image showcases the scene that inspired a figurine’s design. The images are often bordered in brass, that contains the image within. Whether looking to use an original sketch or a modern image, these little plaques are able to tell a story with a single image. Thus allowing for your tree to tell its own story. 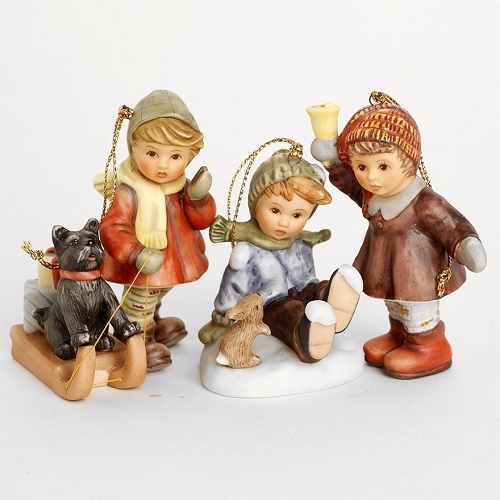 Along side the Christmas Tree Ornaments, you want to consider using Christmas Themed Hummel Figurines. Placing these figurines under the tree, not only complements the trees decorations. They can also add character to the tree and help to further highlight the presents under the tree. 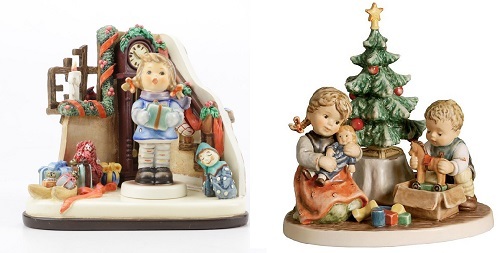 These cute rosy-cheeked Christmas decorations are a great way to show your love for Hummel’s and the holiday season. These decorations have been a tradition in many homes for the Christmas season and will continue to be there for many generations to come.